Just looking through the ways section it appears there are a number of pipes not performing their best, some lookers too. Let's see what you have and hear the problems. Thanks for posting this - great thread idea. 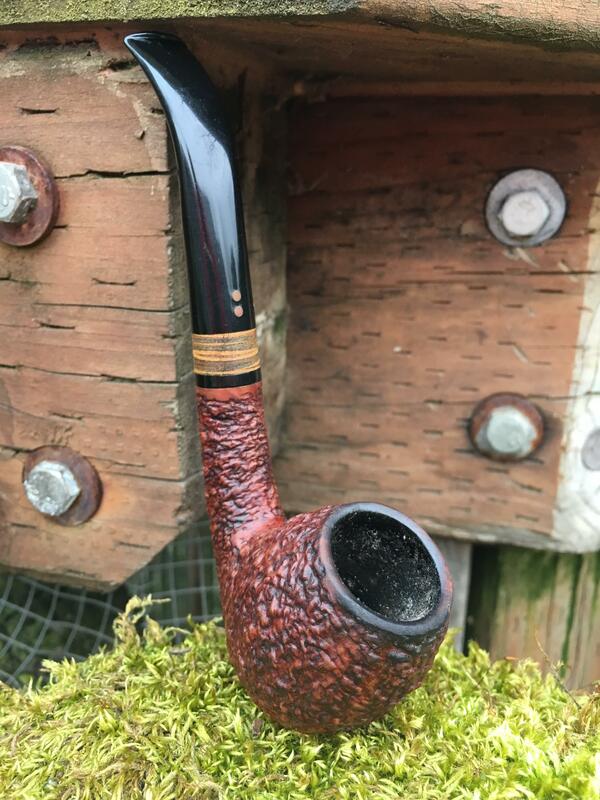 My problem pipe is the egg shape Radice Rind. It's heavily bent and when it starts out, smokes beautifully - but I get gurgle real real fast and have never finished a bowl in it. It did come unsmoked and I've probably only smoked it 5-7 times, so my issue may be cake? It also gets pretty hot, regardless of how slow I puff. I have this issue with other bent pipes too, so maybe I'm just a gurgler (you know what I mean...). However, it also doesn't pass a pipe cleaner very well and the stem is loose and pretty wobbly (I think it's plastic?) so I worry about pulling it out when I get a little aggressive on trying to pass one. I love the shape and style of this pipe so much, but smoking it is a very delicate affair at this point... help! Give it to someone else, they'll tell you it's a great smoker. Is this bowl larger than you normally smoke? Smoking it more only helps whatever the cause. Could be a packing issue creating vapor lock, could be not tamping/stirring the ash enough, or too much. Could be too much or too little air in the bowl, or just the way you smoke. Not passing a cleaner doesn't make or break smoking qualities, but poor drilling can cause turbulence which creates more moisture. How does the shank look inside? The stem being loose could be related to just not smoking it enough, that one is Acrylic. Is the tenon funneled? Radice are great pipes, smoke it like 10-20 more times and see if that resolves or makes any difference in the issues before setting on any irreversible course of action. This bowl is taller than I normally smoke, but not larger. I do tend to tamp too much. The shank seems to be a little deeper than the tenon, so that could be my issue, but the tenon is funneled. I'll smoke it more and see if that helps round things out. It does need some break-in for sure, is SWRA a good break-in 'baccy or is it too aromatic? I agree that pipes that gurgle/whatever for one person might never show a sign of it for another. This suggests that there might be something going on with packing, puffing or tamping. I have never had a Radice, but they are a reputable pipe maker, and I would believe it would come around. My experience with new pipes is that it takes about a pouch of tobacco before they really start smoking "right." That will be somewhere in the neighborhood of 16-20 bowls smokes maybe. I say pick something easy to smoke. SWRA qualifies. Stick with that until it gets sorted. That will remove a variable anyway, and if it is related to packing/whatever, you might get better at it or learn what it likes. Consensus is to smoke it more. SWRA is fine, I broke in a Radice with SWRA and it still mostly sees that. You can use whatever you want but something less fussy like an OTC is a good choice. Let's hear how it's doing after 20 bowls. I agree that pipes that gurgle/whatever for one person might never show a sign of it for another. This suggests that there might be something going on with packing, puffing or tamping. One other thing that is often overlooked.. the average humidity of the place you usually smoke. Moisture accumulation in the pipe happens when moist air is heated(or dry air passes through moist tobacco becoming moist) and then passed across the much cooler area in the shank and stem. The rapid cooling causes the moisture to condense on the walls of the shank and stem, the more turbulence the faster/more cooling occurs and thus more moisture is extracted. If the air in the area you are smoking is already very laden with moisture.. say, rainy Oregon, Florida, etc.. then you are going to be more likely to experience that moisture accumulation. A good example of this is the System Pipe.. I was out smoking un-dried Ennerdale, but on a very dry day(because it had been below freezing) and the well on my system pipe was bone dry after I was finished. Conversely, yesterday it was warm and pouring down rain while I was smoking crispy dry Grousemoor, and when I pulled the stem out to check the well when I was done, there was about a 1/2 teaspoon of water in the well. If you think of a pipe sort as a mini heat exchanger, where heated airf(from the bowl combustion) passes across a cooled evaporator(The shank and stem), and the byproduct is the de-humidification you can see dripping out of the bottom of your window AC unit(Gurgle). Where I'm at currently the humidity fluctuates wildy depending on the one of two seasons. Winter is generally bone dry, sometimes warm enough to be freezing cold and wet but mostly you can freeze dry anything by tossing it outside. Summer is swampy and the temp and relative humidity are often neck and neck. The air gets slippery. These variables all play in to the burn characteristics but it comes with the territory, you'll never risk a gurgle with cigars or cigarettes. They even affect how things taste to me. I've smoked pipes driving cross country, it can be more noticeable going from state to state rather than gradually transitioning through seasons, the more articles of clothing removed the more Virginia and lighter blends I smoked whereas earlier I had been on a Burley/Dark Plug diet. It could be humidity for sure or something with tthe fill job ... or the pipe . I wonder , does it gurgle with any blend put in it ?